A Book And A Brew: Bout of Books 14! Following a pretty successful BookTubeAThon I have decided that after a week away from intensive reading I'm going to go back to it with the Bout of Books readathon this week. I've participated in a few of these readathons before and have always enjoyed them so why not! What is Bout of Books I hear you ask? 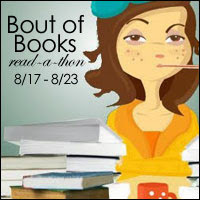 I've always loved how low-pressure Bout of Books is which is why I've decided to participate again. While most people will aim to read a certain number of books, I'm going to aim to read a certain number of pages because I find myself only reading short books and ignoring anything over 300 pages otherwise. I want to ideally read more than 100 pages a day so my target for myself is 700 pages in the 7 days. I'm not going to tell you what I'll be reading as I'm just going to pick up whatever I feel I want to read at the time to keep myself interested and to stop myself getting bored but there will definitely be a wrap up post at the end of the week for you to see what I've read! Are you participating? Let me know below and we can motivate each other! Good luck with B.O.B 14! I did pages last time and it was, truthfully, a bit more fun since I wasn't scouring my shelves for shorter novels. This go-round though I went back to entire books. Nooooot entirely sure why. We'll see how it goes! Thank you! I decided on pages due to the fact I am fast running out of short novels and need to get through some bigger ones! I guess it depends on what is sitting on your to-read shelf. I like the idea of using page count as a goal as opposed to book count. It makes things a bit more flexible, too. I hope you have a great reading week!